For thousands of years people have been attracted to water. Throughout human history, royalty and the very wealthy have wanted to capture the magic by building fountains to enhance both public and private areas. Water is not only a source of refreshment but it has been said that water appeals to something primitive in our human essence... and when we experience the artistry of dancing water it has the ability to touch and charm our innermost being. With every captivating spray, stream and splash set to music you experience a range of emotion from magnificent reverence, chic artistry, electrifying energy to heart touching pomp and circumstance, all while providing elegant, imaginative and one-of-a-kind d�cor. We have used our amazing technical and creative ingenuity to craft a transportable dancing fountains production suitable for most indoor and outdoor locations. At your next special event provide the ultimate in entrancing entertainment and fun, all while leaving your guests with life-long memories of something truly unique. If you would like your event to have new life and extreme impact... just add the enchantment of water! 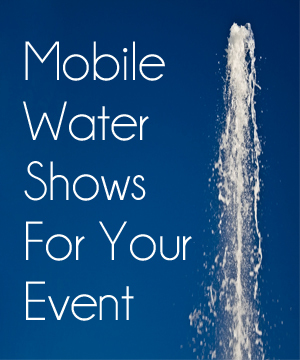 The premiere mobile dancing water show for the event industry. Animated fountains choreographed to music and light both indoor or outdoor for special events, trade shows, weddings, or any celebration that needs the ultimate "WOW" factor!